You are here: Home / Uncategorized / DIY Quadcopters & Drones – Instructions for Hobbyists. DIY Quadcopters can mean many things – building your own house from common materials is one example, building it from logs you cut, dried, worked and assembled is another. The same thing applies to DIY building of Drones. ANY budget can be worked with – you can build a machine for less than $100 or spend $1K+. You can even build your own frames! But since this article is for relative newbies, let’s discuss one of the most popular kits for the 450 sized machine – the DJI Flamewheel. This is the machine shown above in the picture and is available in a kit form that includes many of the components needed to build a mid-sized DIY Drone. Let’s dig down and see what parts you would get – and what additional parts you would need – for such a kit. You will note that a “lite” version of the controller is available in a kit that costs a little less – but in either case you are spending $300 or less. This lite controller works fine – it just does not have as many inputs and outputs to add various gear in the future. For that money, you get a very high quality GPS Drone which is easy to assemble. However, even a completed DIY Drone does not fly by itself. You need a few other things – specially a radio to control it, a receiver that mounts on the Drone to “talk” to your radio as well as batteries and a charger. This is where your ongoing education comes into good use as you must make some decisions and perhaps even ask questions of the vendor…or, better yet, the DIY online community. The Radio – also called a Remote or TX (transmitter) is the thing you hold in your hands with the sticks that control your bird. The receiver is a tiny box that mounts on your Drone and connects to your flight controller by “channels” – one for each action that the drone needs to fly. For example, the minimum number of channels is usually 4 or 5. These have actual names – usually throttle, pitch, Aileron, Rudder and Elevator. For more information on these basics, see the sections of our free eBook here and here. Most radios you can purchase are 5-9 channels – the extra ones are in case you need to control other things (like a camera gimbal). Radios are available in prices ranging from $60 up. A decent beginner radio and receiver will run about $80-$100, better models (if you intend to build more and more units and want the capacity to do just about anything) will be $200 or more. Here is a lower end, but decent, radio and receiver with 8 channels on Amazon. If you are looking for higher end equipment, the Futaba and Spektrum brands as well as Taranis radios are well regarded. Frsky is yet another vendor, with radios from $65 up. A beginner would be fine with setting a budget of $100 and working from there. The DJI Flamewheel is usually powered by a 3 cell (3s) battery with a power storage capability of 2200+ mAh. Make sure the plug type is compatible with the Flamewheel plug (usually XT60). Please consult the current manual for the range of sizes and voltages – you may be able to use 4 cell which would give you faster response and possibly more flight time. Here is an example of a decent battery for most uses of the bare quadcopter (adding payloads may require more power!). Of course you will want to buy at least two batteries and perhaps more if you want to spend some time at the field flying your new machine. You’ll need a charger to keep those batteries topped off – once again, you have the choice of spending as little as $12-$15 or a good bit more depending on whether you want a lifetime tool or just something to charge the batteries (slower). Here is a deluxe unit for about $60. Here is a $12.00 unit on Amazon. There are other units on Amazon and at Banggood which are in the $30 range which are quite decent – here is one example. In addition to the items above, you need a basic set of tools – especially a soldering iron with multiple heat settings and tip sizes. Much of the kit above is “plug in” so you won’t be needing it as much as you imagine, but every drone builder should have such a tool. IN addition, it’s nice to have all the usual electronic tools – a multimeter, sharp X-acto or razor blades and other incidentals such as electrical tape, shrink tubing, velcro and zip ties. If you don’t use them all on this machine you surely will on other projects. 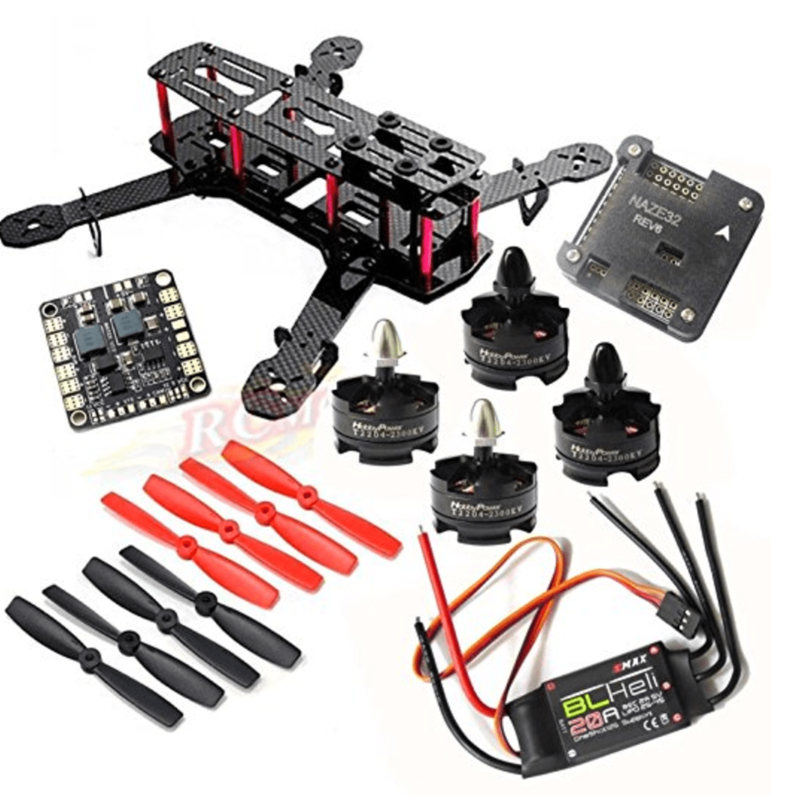 Now it’s time to get busy and build your full size DIY quadcopter. You will learn many things along the way…you’ll make mistakes, ask questions (usually online) and learn how these amazing machines work. You will learn how to adjust the “gain” and other settings on your Radio so that the machine reacts in the way you desire. For example, you may want it to fly like a airliner – nice and comfortably and turn slowly – or, you may want it to race through the air like an acrobatic models. This can be accomplished largely by the programming of the Radio channels combined with the battery strength or type. Good Luck to you! A drone can be built on a MUCH smaller budget than the above DJI kit – however, the drone itself will also end up smaller and perhaps having different capabilities. Most FPV (stands for “first person view” since many pilots install cameras on the front) drones are about 1/2 or less the weight and physical size of the DJI project above. There is even a very popular “tiny drone” movement where hobbyists are building units that weigh only a few ounces. Our advice would be not to start with the tiny models due to the smaller size of the solder joints and the lack of room to work with. A great way to get started in this class would be a model in kit form. You can find kits that include some – or all – of the parts you need to assemble your drone. For example, this kit features a well known flight controller and is about $160 at Amazon. Alternatively, you could make a list (and consult some experienced builder) and choose parts from a multitude of options. Frames start at $15, but by the time you add all the components you are – depending on options – in the range of $90-$200+. 1. The pilots radio sends a signal on one of 4 or more channels over 2.4 or 5.8GHZ connection. This is received by the “receiver” on the drone itself. Here is an article on Radio Frequencies commonly used on Drones. 2. 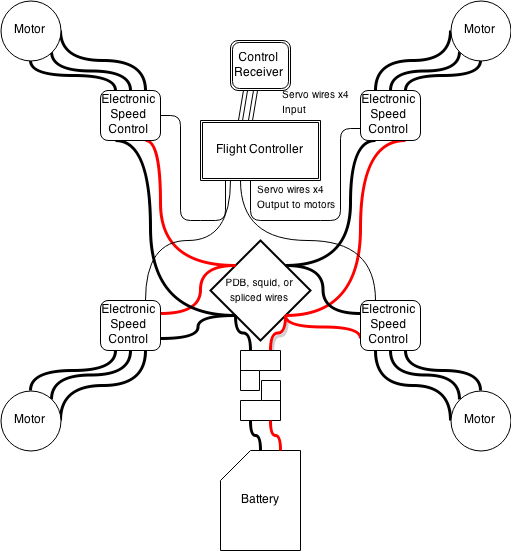 The receiver sends that signal, for example, “maximum throttle” to the flight controller (the main brain). 3. The flight controller sends the signal(s) onward to accomplish the task. In this case, it sends the “floor it” signal to all 4 ESCs (Electronic Speed Controllers) which pass it onto the motor. 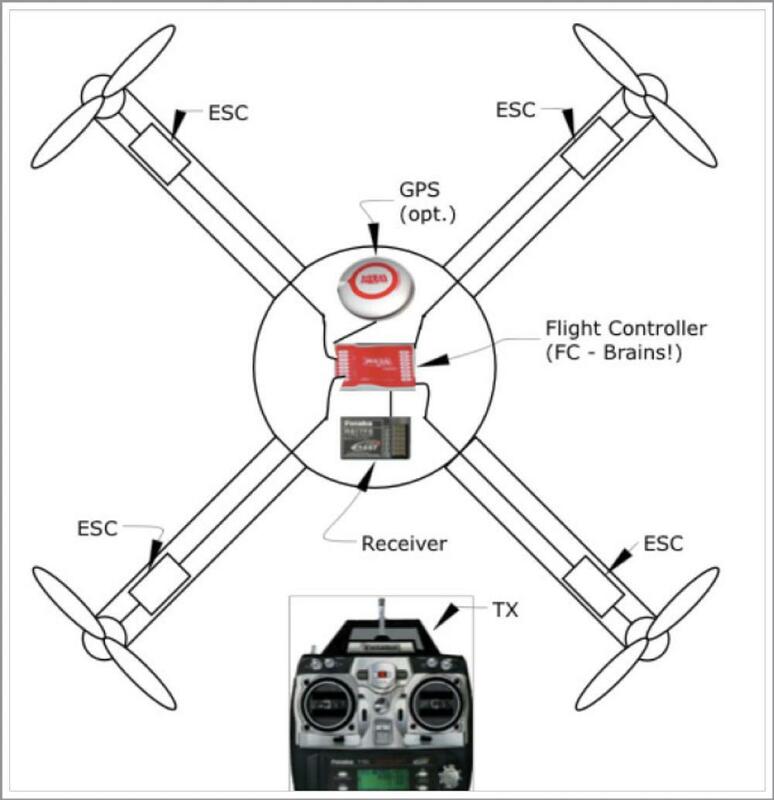 In addition to the basics above, the flight controller may make some decisions on its own – for example, when you go full throttle, the F/C may decide to level the quadcopter first so it goes straight up. This is done using internal sensors (IMU, gyro, etc.) which are inside the flight controller body. Also, many drones have some circuits that deal with power management – it may be that some parts of the drone need much less power (5v, etc.) and much less amperage, while other parts (the motors) need the full wattage. This will become evident if you start adding options such as LED’s to your drone build. Please see our article about a simple FPV project. This will provide the basics of DIY camera attachment. If you build your drone and it works perfectly on the first flight – congratulations! More likely somethings may not work as desired. Here are some of the common mistakes. 1. Bad solder joints. You may be able to test these with a multimeter. Also, make sure one solder joint does not touch another, therefore causing a short of havoc of other sorts. 2. Radio Binding – Radios must be linked (bound) to the receiver. This can often be tested even before assembly or at least early in the final building. 3. Improper or reversed channels. Channels are clearly marked…but it is quite common for them to be reversed or plugged in wrong. In this case, a control from the Radio to go up may make it come down…and/or similar behavior with the other channels. Always weight or tie the drone down for the first tests to make sure the right channels are engaged. This type of problem can be fixed in the radio settings and by plugging the right leads from the receiver to the flight controller. Free Ebook – if you are a real beginner you may benefit from the free eBook offered on this site. Note there are also two more advanced eBooks on RTF (Ready to Fly) DJI Models…also free. The link is here (or on the menu on front page). How Camera Drones Work – an article explaining how more complicated Camera Drone operate is here – and another article explaining just the gimbal (camera stabilizer) is here. Glossaries and Definitions are here and here. Once you advance and wish to build models capable of programming and custom work, you may want to look into the open-source ArduPilot software and recommended flight controllers. Or, stick with DJI – they also sell commercial lines of larger drones and more capable flight controllers. RCGroups is an extensive set of forums – which can get very technical, but where virtually anything and everything about drones can be learned. If you have decided to buy rather than build, consider checking our lists and various comparisons. Our main listing of all classes of drones is at this link. This article is a comparison between somewhat similar Camera Drones. Some basic beginner drones are listed on this page. Please remember that using our links or clicking on our ads helps us support the site (we receive a small commission but you don’t pay any more). If you feel you have learned something from this site, this is a sweet way to “pay it forward” so others can also learn in the future.